Hi everyone, how are things going with you? Are you getting ready to dive in and get some serious kitchen organizing happening? I know I sure am, but I have one more step to take before I plunge in to organized bliss. If you’re just joining us, you can find the first three posts over on my 31 Days page, for a quick recap, here’s what we’ve done so far: made a plan of attack, printed some new printables, and gotten labels ready for when the organizing fun begins. 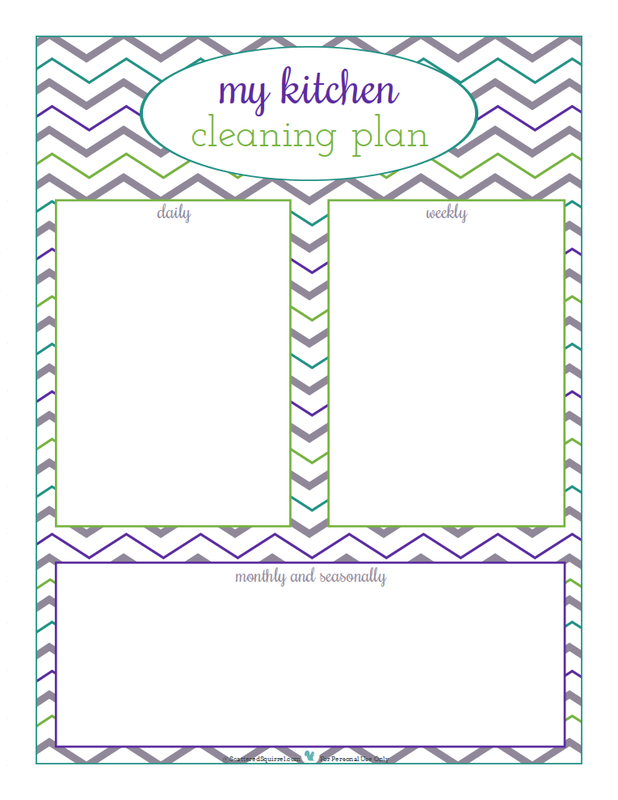 And today I’m sharing my final step in prepping for a total kitchen organizing marathon. Now, I was chatting with a friend last night and she told me I was bonkers. She didn’t understand why I would worry about a cleaning schedule, when I’m going to be busy organizing everything. Her thought was to wait until the organizing is done and then do up a cleaning schedule. If that works for you, by all means do it that way. My way is just that, my way. It makes sense in my head, and I’ll tell you why. the kitchen is the hardest working room in our home, and that will not change just because I’m organizing it. Daily cleaning tasks still have to happen, and I can’t see going a whole month without doing the weekly upkeep either. In fact I get the heebee jeebies just thinking about that. I want to be able to jot down ideas as I go, maybe I notice an area that needs a little more attention than it is currently getting, or maybe something doesn’t need to be cleaned as often as I thought, either way, I’m looking to make kitchen upkeep as efficient as possible. having my cleaners on hand, means that I’ll be able to quickly clean each area I organize, and let’s face it pantries, spice cupboards and fridges tend to get messy with daily use. and though it might be a long shot, it may just be that how I clean the kitchen effects how I will organize it. Those are my reasons for doing it this way. But don’t worry, I’m not going to write a huge long post about cleaning. In fact I’m just here to share with you the cleaners that I use and the printable that I hope will help me, and you as well, create the best, most efficient cleaning plan we can. I’ll start with the cleaners. I make most of the cleaners we use around the house, and those 4 items are the BIG 4 for me. If you search the wonderful web, you will find a ton of homemade cleaning recipes. I’ve been using a combo of these four for a few years now and I love how they work. A 50/50 mix of vinegar and water in a spray bottle. Mix small amounts of dish soap with baking soda to make a paste, and use a damp microfiber rag to clean with. Hot water, dishsoap and about a cup of vinegar in the sink. Soak drip pans for an hour or so, then scrub with baking soda. I have a Rubbermaid Reveal Spray Mop, into the bottle I mix 50/50 water and vinegar with a squirt or two of dishsoap. If I’m giving the floors a scrub by hand I use a mix similar to the one above for the drip pans, but I add baking soda to the water. Use the scrub above, then follow with the All-Purpose spray, then rinse well and dry with the glass cleaning cloth. Some things could probably already go on there. Especially the daily tasks, like washing, drying and putting away dishes; sweeping the floors, wiping the counters, and so on… but I thought I would leave it blank and that way all of us can add to it only the things we want on it. I’m sticking this on my fridge and I plan to make notes as I work my way through the kitchen. As always, to grab a copy for yourself, simply click the picture above. Before I leave you, I thought I would share an “oh duh!” moment I had. You see, when I started this series I jotted down 31 post ideas to go along with this topic. I knew things would change or get shuffled around, but I wanted a good idea of what to write about this month. After I did that, I decided I was going to do the writing, the posting, and the projects in real-ish time with all of you. So I haven’t actually organized my kitchen yet. This morning, I pulled out the items in the pics above and took the pictures in my dining room. I edited them this morning as well, before sitting down to write this post. The only things I’ve worked on ahead of time are some of the printables, because those take a little time. I usually get them finished up the night before the post goes out. So far, this has been working great. Sure the posts don’t go out until around noon my time (Pacific) but they are going out. So, today I’m off to organize my pantry. I’m foreseeing a slightly late night but I can sleep in a little but in the morning. And tomorrow, I will be back here to share with you the finished (for now) project, as well as an update on how all the printables are working for me so far. Do you ever start something with an idea in your head only to realize part way through that there were things you didn’t take into consideration? Do you let hiccups in the road get you down, or are you more of a ‘let’s roll with it’ kind of person?